Assuming you have not gone completely off the grid and you like to take advantage of your grocery sto re’s Frequent Shopper program, the Yarn Barn’s buy 4 get 9 free card and His and Hair’s repeat customer program http://keyringthing.com is the bomb. 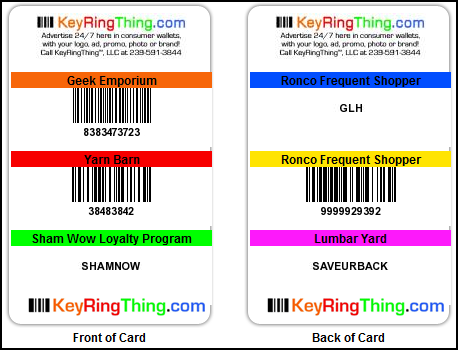 I originally saw this off of LifeHacker but through many different sites, this is a trick way to put all your loyalty card programs on one card saving you from the embarrassing Costanza like wallet. You merely enter in your various programs (up to 6 on one card) verify the codes match and then you can order the cards. There is no charge for the card but currently they charge $2.97 for shipping and handling. If you are so inclined you can advertise on these cards so maybe keep an eye out for FiscalGeek sponsored cards in the future”¦.or not.